Review your insurance coverage before the party. – If the party will be hosted onsite, determine whether you are covered for injuries or damage to property if you serve alcohol on your premises. You may need to purchase separate special event coverage or an additional liquor liability policy. – For gatherings held offsite, such as in a restaurant, request a copy of the venue’s certificate of insurance and determine if you need additional coverage. Don’t make attendance at the party mandatory. Employees should understand that no work will be conducted at the party. Make it clear before the party that overindulgence and other offensive behavior are not acceptable. – Remind employees that alcohol is no excuse for illegal or inappropriate behavior, such as sexual harassment. – Consult your employee handbook and make sure that any company-sponsored festivities are not in violation of the policies in your handbook (such as those relating to an alcohol-free workplace). – Approve the types of drinks that will be served in advance and consider the effects. According to the Centers for Disease Control and Prevention, one 12-ounce beer has about the same amount of alcohol as one 5-ounce glass of wine, or a 1.5-ounce shot of liquor. 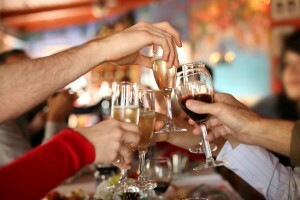 – Consider a cash bar or provide a limited number of “free drink” tickets to each employee. – Be sure there are a variety of non-alcoholic drinks available as well. Stop offering alcohol at least 1 hour before the party ends. Serve coffee, desserts, and plenty of bottled water during this time. Make arrangements for employees to get home safely. Offer free cabs and enlist designated drivers. Remember–you could be on the hook if employees leave a company-sponsored party drunk. Make it a daytime event or family party. Consider serving non-alcoholic beverages only and make it a family-oriented party instead. Vanessa recommends against having company parties that serve alcohol, unless its an overnight party and people who drink stay over, ex: in hotels. However, for more information regarding having a company-sponsored holiday party with alcohol, please call us at (877) 356-6175.